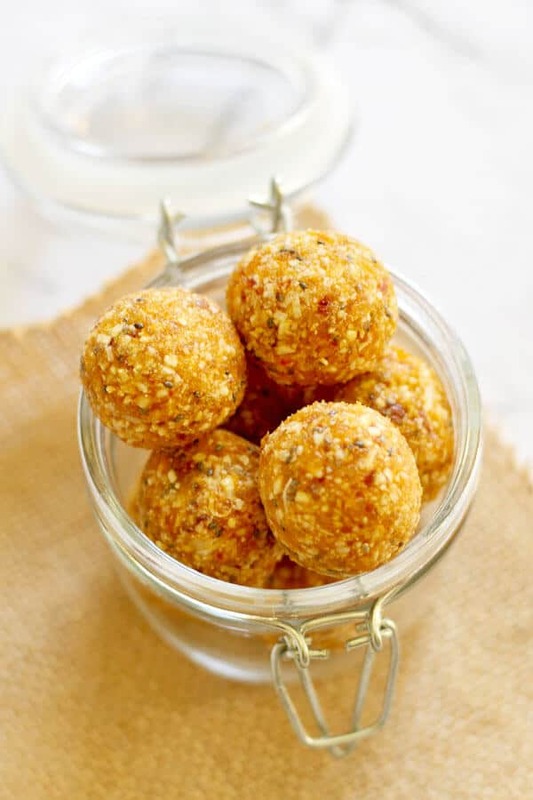 These healthy and nutritious No Bake Apricot Coconut Energy Bites are great for snacking on-the-go or popping in lunchboxes for little ones. These bites have no processed sugar or fake ingredients and are ready in just 10 minutes. Walking down a snack aisle in the grocery store elicits a lot of eye rolling and groaning from me. Just about every product that is touting itself as a healthy way to give you energy throughout the day is really filled to the brim with sugar and artificial ingredients. 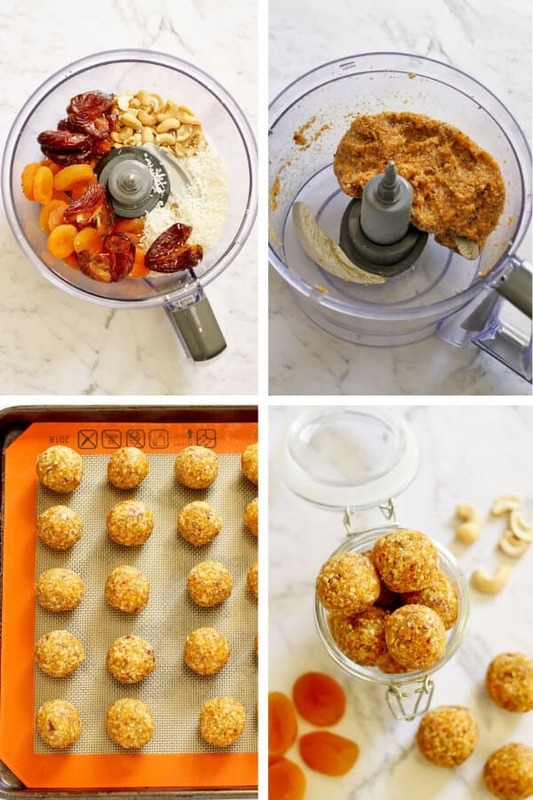 Or you could make your own snacks, like these No Bake Apricot Coconut Energy Bites. They couldn’t be easier to make. Just throw the ingredients in a food processor, process until they are combined and roll into bite-sized balls. Simple! These healthy and nutritious bites are perfectly sweet without any added sugar, and will get you through that 3pm slump when you find yourself wanting to reach for a chocolate bar. I love to make a double batch of these and keep them in them freezer to grab and go as I please. They keep for up to 3 months in the freezer so I don’t have to meal prep as often (or clean that dang food processor twice). 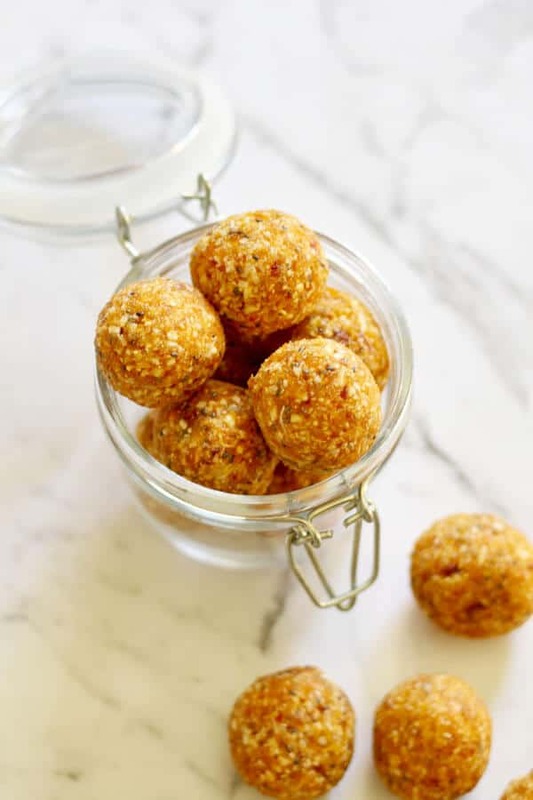 Whether you’ve got little mouths to feed or just want a tasty snack for work, these No Bake Apricot Coconut Energy Bites (say that 5 times fast) will hit the spot. One of my favourite things about this recipe is that almost all of these ingredients are pantry staples, so I can whip up a batch with a moment’s notice. Mixing – If you find the mixture isn’t combining well in the food processor, add a tablespoon or two of water and process again. Storing – Keep in the fridge in an airtight container for 5 days or in the freezer for up to 3 months. Mix the ingredients – Place all the ingredients in a food processor and process until well combined and a dough is formed. Roll into balls – Roll the mixture into small balls with your hands and place on a baking tray. Allow to set – Place baking tray in the fridge for 30 minutes to allow the bites to set. 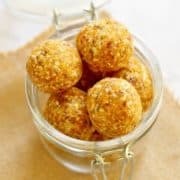 If you’ve tried these No Bake Apricot Coconut Energy Bites I’d love to hear how you enjoyed it! Pop a comment and a star rating below! You can also FOLLOW ME on FACEBOOK, INSTAGRAM and PINTEREST to keep up to date with more delicious recipes. RECIPE VIDEO ABOVE. These no bake apricot coconut energy bites are better for you than store-bought muesli bars and taste better too! Place all ingredients in a food processor and process until well combined and dough-like. The mixture should hold together if you press it between your fingers. If it’s too loose, add a tablespoon or two of water to bind and process again. Continue until you achieve desired consistency. Roll the mixture into balls with damp hands and place onto a baking tray. Use approx. 1 tbsp of mixture for each bite. Transfer tray to fridge for 30 minutes to set and then store in an airtight container. Enjoy! Mixing - If you find the mixture isn't combining well in the food processor, add a tablespoon or two of water and process again. Storing - Keep in the fridge in an airtight container for 5 days or in the freezer for up to 3 months. Inspiration - Recipe adapted from Happy Healthy Mama. Updates - First published May 17, 2017. Last Updated February 13, 2019. No changes to the recipe, just updated photos & recipe tips. Nutrition - Nutrition information is a rough estimate based on one energy bite. These look awesome! Thanks for posting! I LOVE energy bites but I’ve never made them with apricot. These sound delicious and I’m making them later today! Awesome Lydia! Let me know how they go! These look so good! My grandmother had an apricot tree when we were young so it’s a fruit with favorite memories for me. I would love to make these for breakfast! I’d love to have an apricot tree! It’s beautiful how certain foods can remind us of loved ones and great memories! I HAD to pin this. These look so yummy and Im always looking for healthy snacks that boost my energy. Omg can we say yum?!? I just love energy bites!!! Never made them with coconut. I will have to give these a try! Yum is definitely accepted! And I make a couple with coconut! so good! Oh my gosh, these no bake apricot coconut energy bites look super delicious! I’m sure they are better than the store-bought muesli bars and taste better too. I need to try this recipe for sure. Cassie I need you to be my next door neighbour or my best friend. Anything that will get me to pop in and eat your energy bites really. haha. I am trying these out! Yes that’s true. It’s kinda relaxing while you’re baking or cooking. 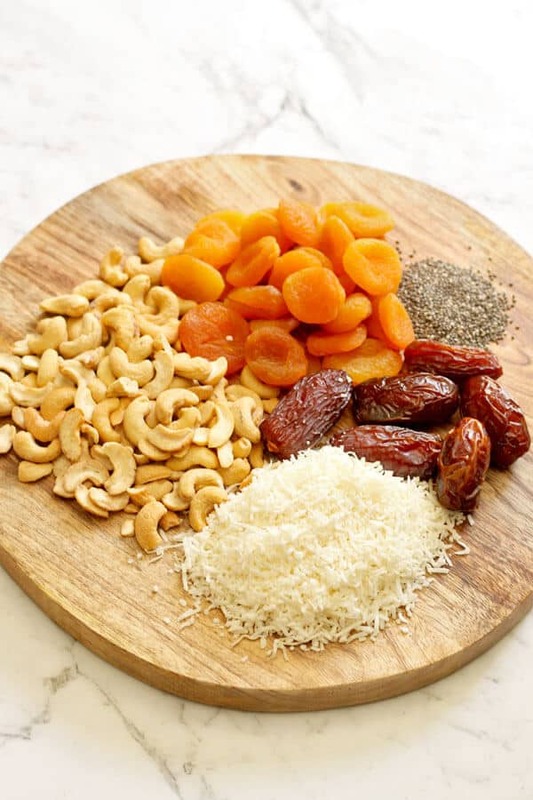 This no bake apricot coconut energy bites sounds appetizing. Love to try it! They are so good Angela! I find cooking and baking therapeutic as well. I’ve never made energy bites before but they sound and look delicious. I’m glad I’m not the only one Brittany! They are definitely worth giving a try! I’ve been wanting to try energy bites for years. I don’t know why I haven’t yet. Coconut is my favorite so I think I may just have to use this recipe and finally make some. Thank you Pamela! They taste amazing too! This is the kind of snack that I love making in the summer. No need to heat up the kitchen because this doesn’t require baking! Awesome! I feel you there Amanda! Nothing worse than an even hotter kitchen in summer! This sounds amazing and it’s also the perfect snack before or after a workout session. I love the fact that you don’t have to bake it! So easy! Thanks Elizabeth! Let me know if you give it a try! It’s easy to have an addiction to energy bars. They are so tasty and pretty good for you. I love trying out new recipes because you never know what new flavor combos you will come up with. I love a good no bake treat! These look easy to make too! Thanks for the creative recipe. These sound yummy- definitely a quick and easy breakfast to bring on the go, too! You’re right Sarah! They’d be perfect to chomp on for breakfast if you were in a pinch! These sound like great flavors, I haven’t ever made anything like this before but it looks wonderful! So simple Debra and they go down a treat! Yummy! I have seen these all over pinterest, good for you! I know I want to make some. How did you make the balls so pretty? Oh thank you Terri 🙂 I don’t really have a special technique and most of the time think I’m doing a terrible job at keeping them uniform and pretty so I’m glad you think so! Probably my only advice would be to make sure the mixture is wet enough to stick together properly and roll roll roll! I’ve been wanting to try to make a recipe like this for quite some time. I like that all your ingredients are healthy and naturally gluten-free which makes it easier for me to make something like this. I’ve seen other recipes similar to this but they have oatmeal in them which is something I can’t tolerate so I am very happy to see that your recipe does not contain Oats. Looks like there was a reason I couldn’t get the oatmeal ones quite right then Janel! So I could make this recipe for you! Hope you get to try them! So tasty! Thanks Cass! That’s so sweet! I love that these are no bake! I am ALL FOR anything that I don’t have to turn the oven on for in the summer heat!! I feel you there Robin!! This is a great recipe. With the apricots and grain, it is very healthy. But, for me, I will eat them like candy. Thanks Lois – I do have to show a lot of self restraint when I have these on hand! Wow can’t wait to try this! Apricot is not normally a fruit I cook with so I am excited to try this! So good Lisa!! You’ll have to let me know how you go! mmmm, I love anything coconut, and these would make a great work or workout snack! Thanks Jeni 🙂 I can’t stop eating them! These look so tasty! I’m always eager to try new healthy and delicious snack recipes, so this one is definitely going to be tried in the very near future! Awesome Cait! I can’t wait to hear what you think of them! They are a must in my house at the moment!